With rich flora and fauna, India is the most preferred travel destination among the wildlife lovers who want to click the best of wilds in the woods. The country is blessed with many national parks and wildlife sanctuaries thus, offering an excellent opportunity to wildlife photographers. Considering the zeal for wildlife photography, we offer an exclusive 10 nights and 11 days Wildlife Photography Tour to Central India. Our tour will take you from Delhi to Bandhavgarh National Park and Kanha National Park, two of the famous national parks known for spotting Royal Bengal Tigers. So, grab the deal to travel with us to the travelling to wilderness areas in Central India. On arrival at Delhi airport you will be welcomed by our representative & transfer to hotel. Rest of the day at leisure OR for your own activities. Overnight stay in Delhi. Morning at leisure after breakfast transfer to domestic airport in Delhi to board the flight for Jabalpur. On arrival at Jabalpur airport meet with our representative & transfer to Bandhavgarh National Park. Dinner & Overnight stay at the wildlife resort. Bandhavgarh National Park, the most admired national parks in India is located in the Vindhya Hills of the Umaria district in Madhya Pradesh. The area of Bandhavgarh is being flourished with a large biodiversity, the place which is also being famed to hold highest density of tiger population in India. Similarly, the park also contain the largest breeding population of leopards and various species of deer. Over the years, the park has shown a great number of increases in the count of the tiger species and this is the reason why tiger Photography tours is so famed to attract large amount of tourists at its locality. 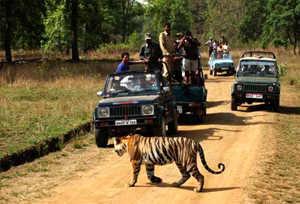 Morning & Afternoon half day open jeep safaris for Bandhavgarh national park. Overnight stay at the wildlife resort. Explore the richness of Nature at Bandhavgarh National Park with jungle safari tours and discover what makes this gem a paradise for photographers & wildlife lovers. A Jeep safari tour is the best way to come face-to-face with some fiery faces (tiger, jackal, wild boar etc) of the park. After 03 days of safaris at Bandhavgarh this is the morning to relax at the resort, have breakfast, take some rest & after lunch start your drive to another photography paradise Kanha National Park. Arrive Kanha in the evening. Dinner & overnight stay at the wildlife resort. Kanha National Park is situated in the Maikal range of Satpuras in Madhya Pradesh, the heart of India that forms the central Indian highlands. 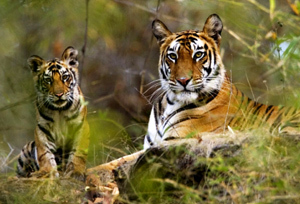 By bringing up the buffer and core zone all together, the Kanha Tiger Reserve has the total area of 1945 sq km. Kanha National Park is the ideal home for wide ranges of wild creatures; right from the tigers to the most populated Barasingha and the countless species of plants, birds, reptiles and insects. This vivacious land has been the source of inspiration for Rudyard Kipling, a famous writer for his wonderful creation - "The Jungle Book". This reserve has attracted many wildlife photographers around the corners of the world with its well developed infrastructure specially meant for them. 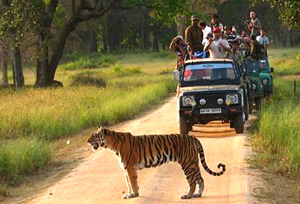 Morning & Afternoon half day open jeep safaris for Kanha national park. Overnight stay at the wildlife resort. A safari drive in an open jeep is the most exclusive activity to enjoy at Kanha. 04 WD open Jeep safaris are not just the regular way of enjoying the wild expeditions at the park without disturbing the routines of animals but are also preferred by those who want to have wider views of the surroundings. After a week long fabulous days of safaris at Bandhavgarh & Kanha reserve, now this is the time to bid goodbye to the wonderful places of Central India. After breakfast start your drive to Jabalpur airport to board the flight back to Delhi. On arrival at Delhi Airport meet with our representative & transfer to hotel for an overnight stay. Morning at leisure in time transfer to the international Airport in Delhi to Board the flight for home country. The memories will linger on in the many photographs that you have captured during this wildlife Photography Tour to Central India.